Just hours into his term as the interim UNC – Chapel Hill chancellor, Kevin Guskiewicz had a controversy to handle. He was named to the interim role by interim UNC System President Dr. Bill Roper on Wednesday afternoon. 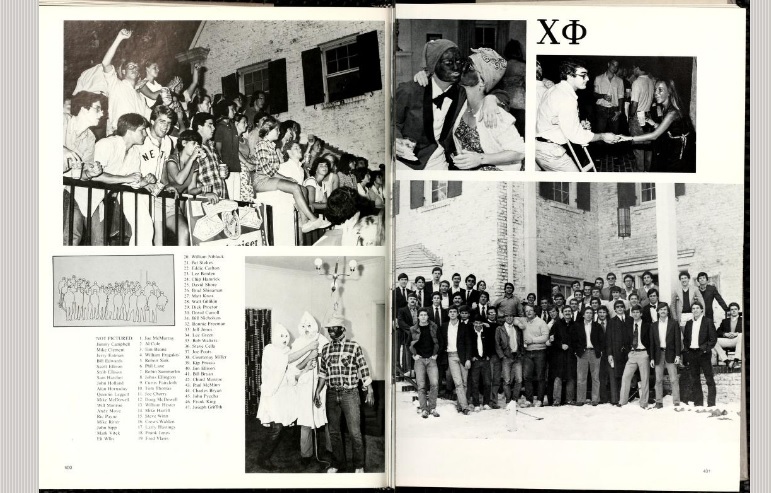 Less than two hours later, Colin Campbell, editor of the News & Observer state government news publication NC Insider, tweeted a photo from the 1979 UNC yearbook of two members of the Chi Phi fraternity dressed in KKK attire while a third member was in blackface with a noose around his neck. Guskiewicz addressed the issue on Thursday morning at his introductory press conference. Roper was also speaking with reporters and condemned the actions in the photo. The photo of white students in blackface comes as Virginia’s governor and attorney general are facing backlash after both were associated with blackface photos. The issue also comes as the university is working to determine the future of the Confederate monument known as Silent Sam that stood on the UNC – Chapel Hill campus for more than 100 years. The statue was toppled by protesters last August. Then-chancellor Carol Folt ordered the removal of the remaining base of the monument in mid-January when she also announced her intention to resign at the end of the academic year. The UNC System Board of Governors accelerated that resignation date to the end of January. Public records previously reported by WCHL show that Guskiewicz was concerned with the impact the statue was having on the campus in the fall of 2017, when the statue was intact. Roper said on Thursday that the feeling Guskiewicz had expressed on the statue was part of the reason he was the right choice to lead the university. “He’s on record as saying that the monument should not be anywhere on the campus,” Roper said. “It rather should be somewhere else, and that’s my position as well. And I’m comfortable with his position. Five members of the UNC System Board of Governors are working with the Chapel Hill campus to develop a plan for the future of the monument by mid-March.